In large bowl, whisk together a 1/4 cup of the olive oil, red wine vinegar, garlic, salt, pepper and chilli flakes; add peppers, capers, shallots and parsley, tossing gently to coat. Transfer to shallow serving dish. Marinate for 20 minutes at room temperature. 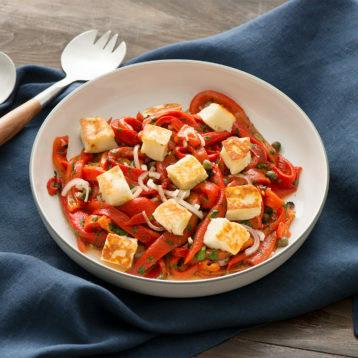 Meanwhile, heat remaining olive oil in large nonstick skillet set over medium-high heat; cook halloumi, flipping as needed, for 5 to 7 minutes or until golden brown on all sides. Drain on paper towel–lined plate. Scatter over roasted red pepper salad. Serve immediately. Serve with toasted, crusty bread for dipping.